We have the commitment to be the cheapest store on the internet, this means that we search for the prices our competitors have and we beat them to give you the best price you will find on the internet, on the bottom of most of our products you can find the price comparison we did to prove we are cheaper than stores such as: Amazon, Target, eBay, Walmart and much more. 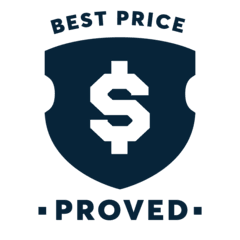 With this we make sure you spend what is fair and not an overpriced product, also you can spend less time searching in all the websites for the best price in the same product. We try to keep our price comparison as updated as we can, but they can change without a notice from us to you, but if you have a question and want to check how updated is our price comparison in the product you like please contact us.